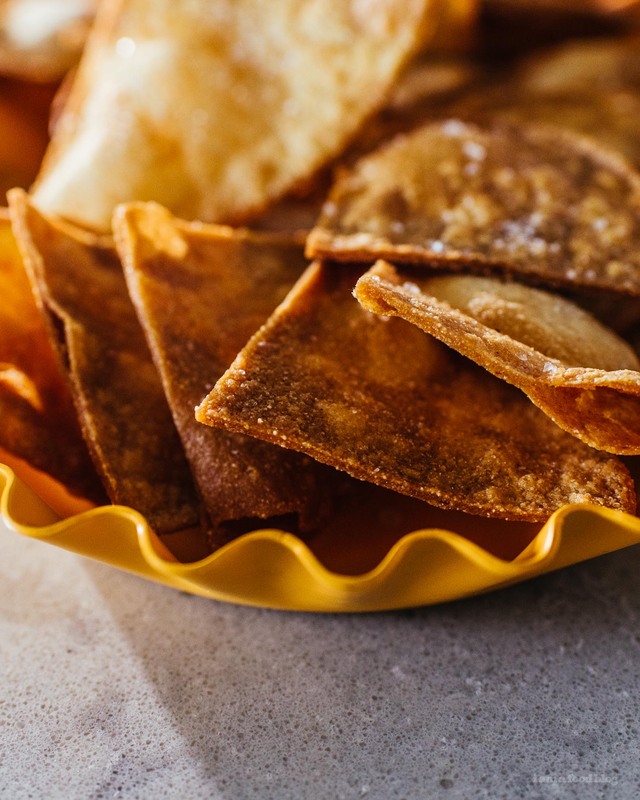 Crispy, crunchy, hot and fresh from the fryer homemade tortilla chips are easier to make than you think. All you need is a package of tortillas and a bunch of oil! We are currently in Japan – Hokkaido to be exact – glamping so I apologize for the lack of posts. We will definitely be posting a bunch of things about our trip soon, but before then I’m going to tell you guys about these tortilla chips. I have a love-love relationship with tortilla chips. What’s not to love? They’re crispy and crunchy and the perfect vehicle for shoveling dips into your mouth. My all time favorite tortilla chips (I’ve eaten a lot of tortilla chips) are freshly made ones. They have a heft and crunch to them that store bought ones don’t. I find store bought tortilla chips more brittle and fragile. 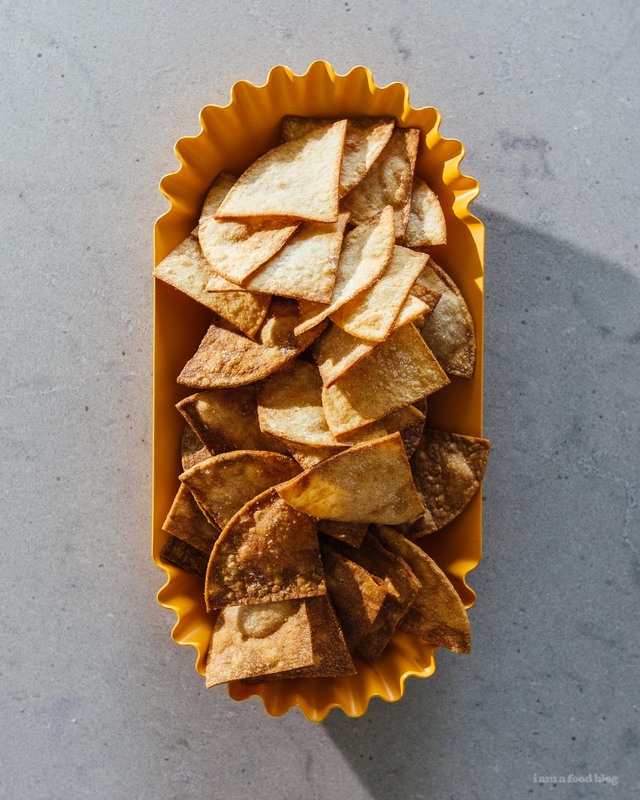 While they definitely have their place in my heart – I don’t discriminate against different tortilla chips – sometimes you need a chip that will be able to handle the heavy lifting. I’m pretty sure that everyone who’s been to a decent Mexican restaurant has experienced the joy of freshly fried chips. But if you haven’t, don’t despair because chips can be in your life faster than it’ll take you to get to your favorite taqueria. 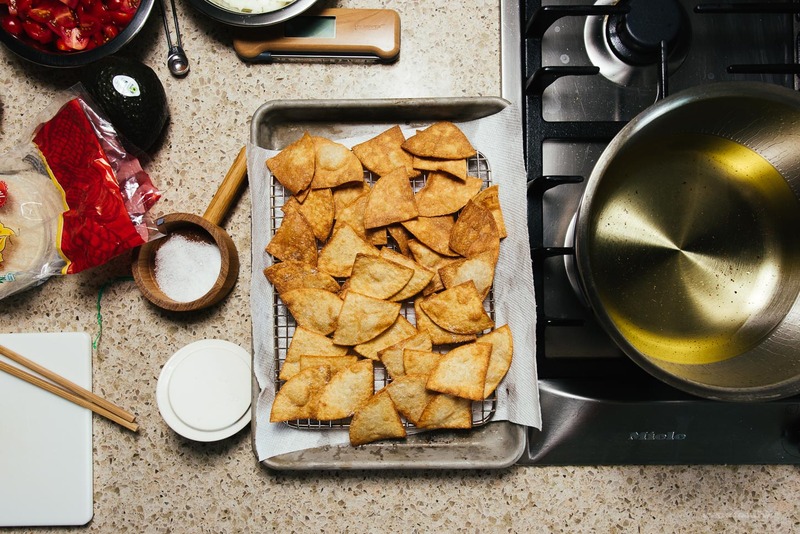 This recipe is perfect for old leftover tortillas so the day after taco night, get the oil out because it’s time to deep fry. This is the simplest recipe and if you haven’t deep fried before it’s actually a perfect thing to start your foray into deep frying. Because tortillas are extremely low moisture, there will be zero splattering, which is what I think is the most nerve wracking part of deep frying. Even so, here are some tips so your chips are golden and delicious. The less water content you have in your tortillas, the quicker and crunchier they will fry. 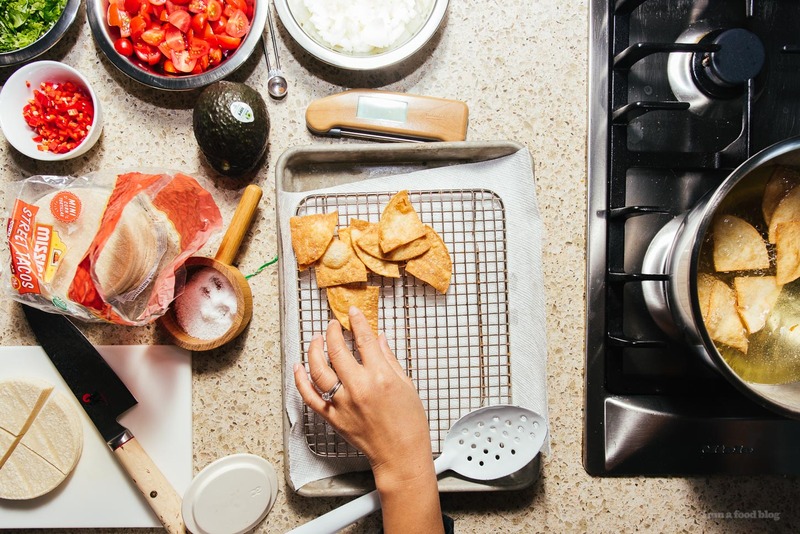 Cut up your tortillas into triangles and leave them uncovered to dry them out a bit. If you don’t have time for this, it’s not a big deal, you can use fresh tortillas too, but old tortillas are best. Use a deep, heavy bottomed pot for deep frying. A heavy bottomed pot will hold the heat of the oil and the depth will help contain the oil with minimal splashage. You want to have a spot for your tortillas to drain. If you just put them on a plate without a rack or paper towels they have the possibility of steaming up or getting slightly soggy. A wire rack is best because there will be airflow around the chips, but paper towels work to soak up excess oil as well. Seems counter intuitive but take the chips out slightly before you think they’re done because they’ll continue to brown slightly outside the oil. If you leave them in until you think they’re perfect, they’ll be too brown. Salt your chips right after they come out of the oil. The hot oil on the surface will help the salt stick. If you salt after the chips are cold, the salt will just slide right off. Alright, that’s it! Hope you guys have some homemade chips in your future! I know that when we get back home, I’ll be making a fresh batch. I’m open to suggestions on what to dip them into too – I love a good dip so if you have any favorites, let me know! Spread out the tortillas to dry them slightly. It’s best if you use old tortillas, but fresh work too, just lay them out for a bit. Heat up the oil in a deep, heavy bottomed pot over medium heat until it reaches 350°F. Make sure that the oil is only about 1-2 inches deep. 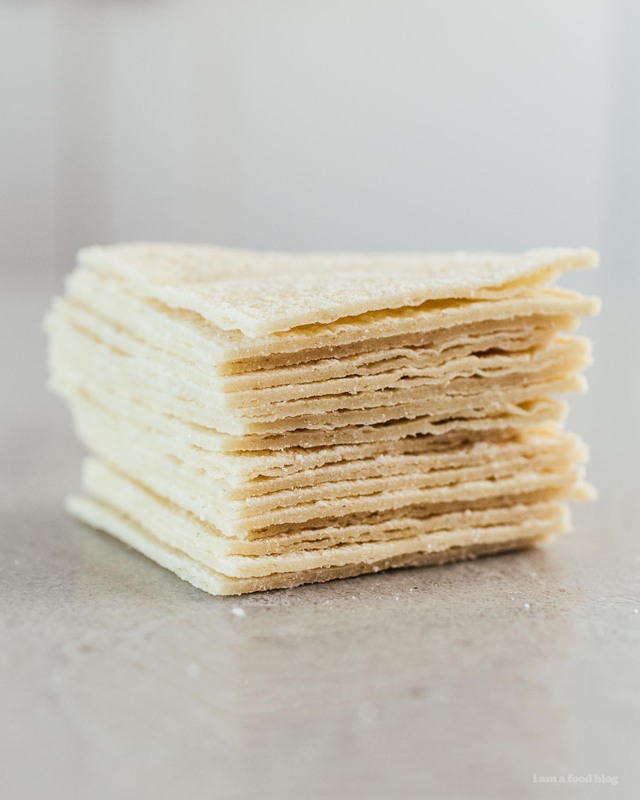 Prepare a baking sheet with a wire rack or a plate lined with paper towels to drain the chips on. 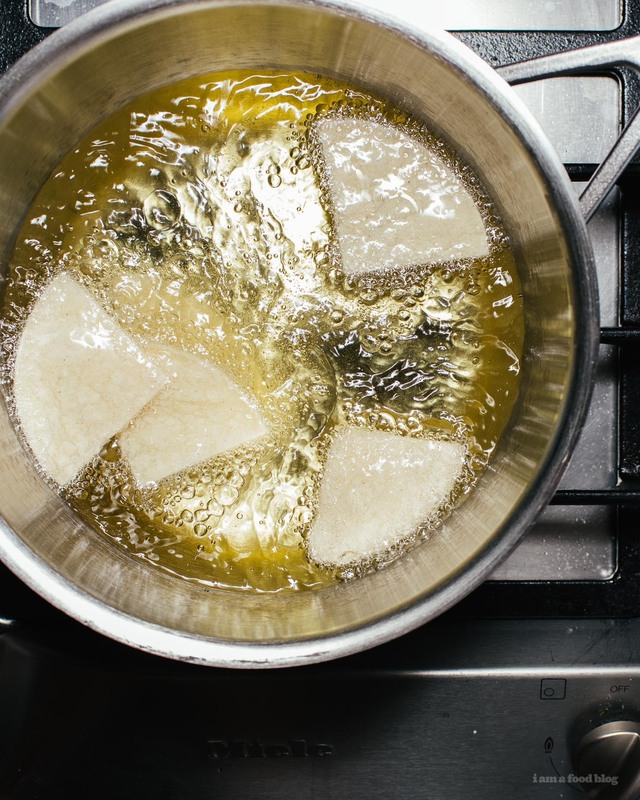 When the oil is hot, carefully drop the tortillas, in batches, into the oil and fry, stirring and flipping every so often until golden and crispy. Use a slotted spoon to scoop them out of the oil when lightly golden. You want to pull them out of the oil early as they’ll continue to brown slightly as they cool. Drain on the prepared baking sheet or plate and season generously with salt while still hot. 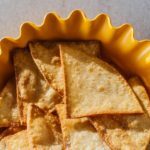 Repeat with the remaining tortillas until you have a batch of chips!